The Duke of Windsor once called America "one big golf course." This blog by writer, anthropologist, and sometime journalist Orin Starn explores golf and its place in America and the world. The PGA Merchandise Show is an enormous golf industry tribal gathering. 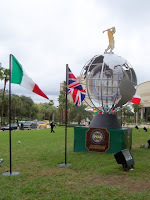 More than 45,000 pros, PGA officials, company reps, reporters, and sundry others filled the Orlando Convention Center this past weekend for the event. So big is the Convention Center that it makes an airplane hangar look like a mud hut. A large indoor golf range next to the club exhibits took up only a fraction of the space. 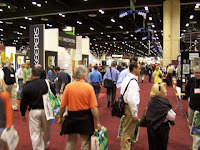 The various sections from “Golf Apparel” to the “Golf Travel Pavillion” to the “New Company Discovery Zone” were large enough to be trade shows themselves with dozens of exhibitors. A foldout show floor plan resembled that for a mid-sized city with markings for hundreds of vendors, three exhibition stages, and row upon row of booths featuring everything from new, Titanium driver-adapted tees and robotic range ball picker-uppers to the latest digital swing training systems. The show measures the sociology and sensibilities of the golf industry. Although the thoughtful Edward Wanambwa of African American Golf Digest reports the numbers have grown some, you still see very few black vendors (and by contrast the low-paying security, janitorial, and shoeshine show jobs are filled mostly by African Americans and Latinos in the familiar American crossroads of race and class). The industry’s look remains overwhelmingly white despite a growing Asian and Asian American presence, including the new AAGolf Magazine. It’s also mostly a man’s world. With exceptions like appearances by Paula Creamer and the fabulous Nancy Lopez, the bulk of the relatively few women at the show were connected with the apparel industry. By contrast, men make up the vast majority of club manufacturer and technology company reps. It’s another persisting American patterning of society -- women to the “soft” realms of beauty and fashion; men to the “hard” enterprises of technology and science. The golf industry ideal of proper masculinity is itself almost charming in its stubborn retro propriety. I didn't spot a single wisp of facial hair among the thousands of pros and company reps who congregated in Orlando. A bearded PGA pro is as unthinkable as a clean-shaven imam. And long hair? Wycliffe Jean forbid. In retrospect, Jack Nicklaus was a golf grooming revolutionary letting his hair grow almost to the collar back in the groovy, psychedelic plaid pants 70s. As America has at least ostensibly embraced the concept of racial equality and women’s rights over the last few decades, various sectors of society have reacted in their own ways. Golf, needless to say, has never been an avatar of progressive values. For better or worse, it has now embraced a kind of “weak multiculturalism.” No legal barriers block people of color from joining the golf world in this post-Civil Rights era; but neither have the PGA or the game’s establishment rushed to be more inclusive, or done much to get the golf industry to look more like America. There are less than fifty black American PGA pros in a country with more than two million black golfers. A parallel kind of “soft feminism” prevails. Women are welcome enough in golf and at the show, and yet something of an afterthought. As the charismatic, well-spoken Suzy Whaley pointed out at a show seminar, you find the women’s tees a bumpy mess at too many courses; and, on occasion, male golf pros fall into the same well-intentioned but condescending voice with female students that they would with a kindergartner. The relatively sparse attendance at Whaley’s show presentation, in spite of her celebrity as the first female PGA tour qualifier, itself indexed that golf remains a game more for him than her. But it’s no news flash that golf leans to the right. Especially for an outsider like me, the show’s single most striking feature was the visibility of new technology. The futurist Alvin Toffler famously asserts that human history has gone forward in three great stages. First came the agricultural revolution, and the accompanying rise of complex, stratified societies like ancient Egypt, imperial China, and the Olmecs, Moche, and other pre-Columbian conquest states of the Americas; then followed the 19th century industrial revolution with its machines, factories, and massive urbanization. Since the 1980s, the advent of computers and nanotechnology has been linked to a third sea change in global society, the information age. We live now in this new era transformed by the realities of cell phones, the Internet, and the 24/7 global flow of trade and communication. Golf is rushing headlong into the brave new digital world. Whether handheld GPS yardage systems and infrared putt recording devices and the Tracman Doppler radio ball flight tracker, every aspect of the golf industry is being transformed, in some cases revolutionized. I stopped by the i-Club booth. There the knowledgeable young sales rep Zach LaValley demonstrated the new technology developed by this company founded by three MIT grads. The i-Club is an appropriately miniaturized 2.5” long and screws onto the head of putter or club. The wireless connectivity and special software program provides 3-D swing feedback including clubhead speed, tempo, and angle of attack and direction; it can be used in teaching as well as in club-fitting. You can also connect an i-club to the Microsoft “Links2003” video game for a virtual round as Sergio Garcia, Annika Sorenstam, or just yourself on any number of legendary world courses. It’s not real outdoors golf, of course; but it’s not fake either insofar as you’re swinging the i-club with your flesh-and-blood body. One can only call it “hypergolf.” Here one sees the broader trend of a digitally-enabled world of simulation and computerized images that blurs, even shatters, the old metaphysical boundary between the authentic and the fake, nature and technology, and reality and fantasy. The technology revolution extends almost everywhere. Consider the golf cart. As company rep Phil Davis for Uplink demonstrated for me, the latest models incorporate every imaginable new high-tech bell-and-whistle. This young company has developed GPS-based hardware and software that can be installed on any golf cart, although it has a special partnership with industry giant ClubCar. There’s multimedia audio; a full-color, in-cart display of the pin position with exact, to-the-pin yardages; a central control system that allows the pro shop to shut or slow down the cart if it goes into prohibited marshy areas or leaves the property. It’s a more sober, golf-style version of what would happen if you took your cart to Pimp My Ride to get it tricked up with all the coolest new computerized gear. New technology is even transforming the more staid business of tee times. The long, penciled list with names crossed out and fill in on a big sheet of smudged white paper was a fixture of every pro shop in older day. But, as Robert West of Fore Reservations Inc! explained to me, his company markets course management software that has made pencil and paper obsolete. These integrated programs allow the modern-day golf pro to manage financial records, mail marketing, computerized tee times, inventory taking, and bar-coded shop price tags. A pro must increasingly also be something of a computer geek in the new golf world. Less than a third of courses nationwide now allow for self-service Internet reservations. One suspects that virtually all will within the next decade. Perhaps the loudest technology buzz is around club-fitting. Custom club Einstein and best-selling author Tom Wishon has long pointed out that sticks sold straight from the rack – or just some demo club range experimentation – make a bad fit for the average amateur. But only now is club-fitting beginning to take off. It’s partly a matter of economics. As pro shop sales have stagnated or declined with the flattening numbers of new golfers and tough competition from mall golf superstores, club-fitting offers a way to recover customers, or at the very least stay competitive. The excellent public Hillandale Golf Course close by my house here in Durham built its own fitting shack just last year. That golfers hear about the latest specialized club-fitting on the Golf Channel and the Internet has also encouraged amateurs to want the service themselves. Once the golf pro was like the doctor – an almost God-like specialist whose expertise you trusted for lack of real access to information of your own. Nowadays just as patients do research and sometimes diagnose their own symptoms at medical advice chat rooms and web-sites, so increasing numbers of golfers come to the pro shop knowing – or at least thinking they know – a great deal about the club performance and fitting. It’s the age of educated, finicky consumer. Technology is also key to the equation. You can do some fitting with cheap, pre-digital tools like a lie board and simply observing ball flight on the driving range. But the advent of far more sophisticated technologies – including the i-Club – has revolutionized club-fitting by providing a whole new level of data about spin rate, launch angle, and other variables that no one had even dreamed of measuring a couple of decades ago. The smart, personable PGA Learning Center Technology and Operations manager, Gene Powell, gave an overview of these technologies to a packed room of pros. The latest fitting tools include everything from laptop-friendly launch monitors at about $3,000 and indoor simulators in the tens of thousands of dollars like AboutGolf and the P3ProSwing to the even more pricey TaylorMade MATT 3-D Fitting System with multiple cameras tracking both clubhead and ball. A show of hands suggests that only a comparatively small percentage of club pros do anything like such high-tech fitting in their shops. The necessary investment is also daunting. It does seems as if the demand for club-fitting will continue to expand, at least among what remains the large numbers of serious American golfers. I wonder about club-fitting. It’s not so new in a way: the latest in a longer hobbyist, get-under-the-hood-and-tinker-around brand of American masculinity. 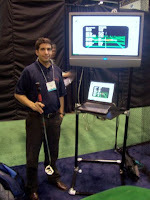 Golfers have always loved gadgets and experimenting with one’s equipment is part of the game’s pleasure. Less convincing are the claims that club-fitting will keep more golfers from dropping the game in frustration. It’s hard to believe that a few strokes here or there will make a real difference. And, in fact, the average American golfer is so bad – the mean for men is about 94 – that equipment doesn't matter much one way or the other. One has to question especially the “need” for the down-to-the last millimeter nano-fitting provided by expensive new machines. After all, a golfer can get clubs with about the right shaft length and stiffness as well as clubface angle with the low-tech fitting tools of a tape measure, lie board and hitting some range balls. My guess is that anything more than this has relatively diminishing, marginal returns in saved strokes for all but the elite level golfer. Does Joe Sixpack need to be fitted with a $60,000 Taylor MATT System? I doubt it. There’s a larger question of priorities in the whole golf technology revolution. Why are we spending hundreds of millions of dollars developing new digitalized golf training systems when more than half the globe’s population lives in poverty? How can one justify buying a two thousand dollar set of the latest Srixon clubs when that’s more than a PGA show security guard with a family of four earns in a month? What does our obsession with having the latest, most expensive toys say about our values and vision for ourselves and our society? The PGA Merchandise Show is something of a temple to guiltless extravagance and consumer capitalism gone wild in a world of haves and have nots. But, of course, these are the ravings of a left-leaning, politically correct professor who happens to like golf. That bearded 19th century prophet, Karl Marx, failed to recognize capitalism’s flexible resilience, not to mention the atrocities that would be committed after his death in socialism’s name. But Marx foresaw that capitalism would bring constant technological revolution -- the holy profaned, the shattering of the old in the rush to the new. As much as he detested capitalism’s savage inequities, Marx admired the entrepreneurial energy of the business classes, the "most revolutionary" figures in world history for their tireless-profit seeking energy and initiative. The great social theorist further understood that capitalism would shrink the world itself in "battering down China's Great Wall” and traditional societies everywhere to join the world into a single interconnected system, careening headlong towards the future. The old iconoclast wouldn’t be surprised that the most capitalist of sports, golf, is growing rapidly in the nation of Confucius, Mao, and the gleaming Shanghai skyscrapers. There will be no stopping the golf technology revolution anytime soon.